These classes can help build endurance, strength, and speed in a fun, upbeat way that makes you enjoy working out. Each class has an interactive and engaging format that consists of endurance work, sprints, tempos, and hills in order to aid with strength, endurance, speed, form, weight loss and self-confidence. 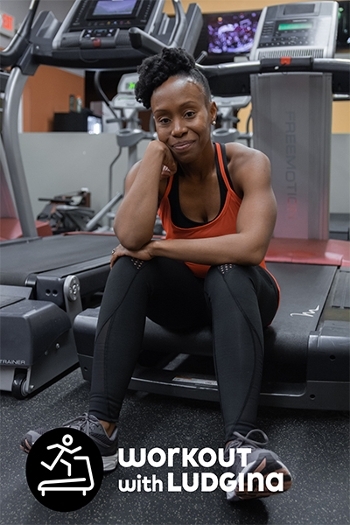 Owner of Workout with Ludgina, Ludgina Dieujuste, came to the Illinois SBDC for the Metro East at Southern Illinois University Edwardsville in October 2018 with a business idea and her passion for running. She knew she could count on her local SBDC to help guide and support her throughout the process of building her business. SBDC Business Specialist Marti Guntren has assisted Dieujuste in reformatting her business plan and reviewing it for possible lenders, as well as aiding in the process of registering her business, and providing additional referrals for lenders and lawyers. Dieujuste was overweight growing up. One day she went for a run and has never stopped. Her passion for running and connecting with others has grown with each step she’s taken. She is also a Road Runners Club of America (RRCA) Certified Running Coach. To celebrate the launch of Workout with Ludgina, you can enjoy the first video at a rental fee of just $1.00 for 15 days. The first video will be available Monday, April 1. Workout with Ludgina can be contacted through email at workoutwithludgina@gmail.com. For more information, visit WorkoutWithLudgina.com. You can also find her on Facebook and Instagram. Photo: Owner of Workout with Ludgina, Ludgina Dieujuste.